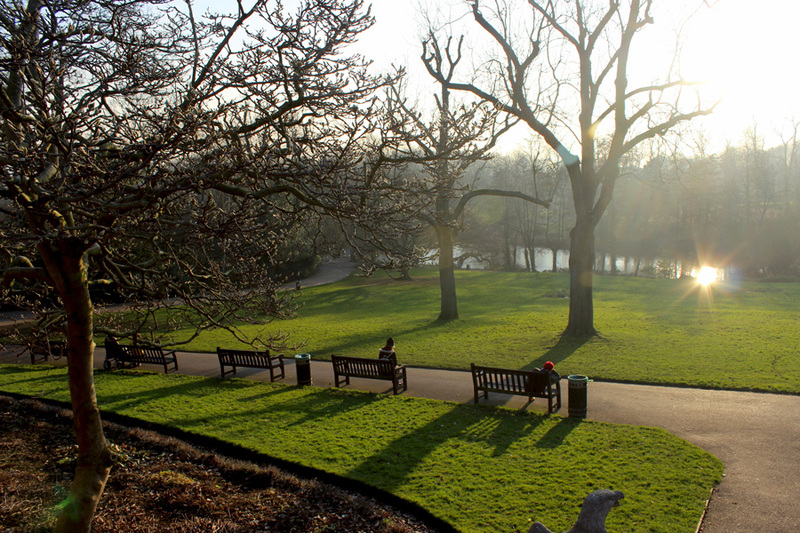 And we are back with the next installment of the series ‘Walk the Walk.’ In this series we highlight some great walks you can do in London and anywhere else in the world. This, because walking can give you a whole new perspective of a place and can show you much more than any other means of transport. Let’s start from the beginning. I get the inspiration for my walks from all kinds of sources. Friends who share their favourites, the Internet, and books. The walk I did with a friend in Highgate was partly inspired by a walk from a book called ‘London’s Hidden Walks: Volume 3’ by Stephen Millar. I love his books and use them often as a guideline. 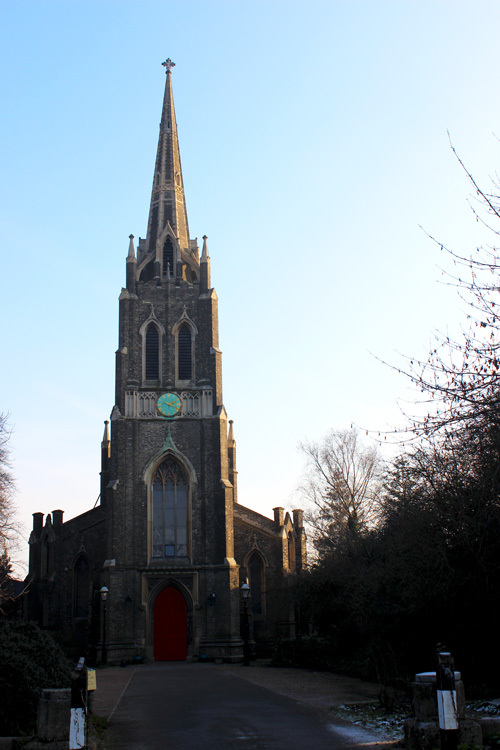 Highgate is an area of London, approximately 4.5 miles (7 km) from Charing Cross in the North-East. It is clear from the minute you get off at its local tube station that this part of town didn’t always belong to London. 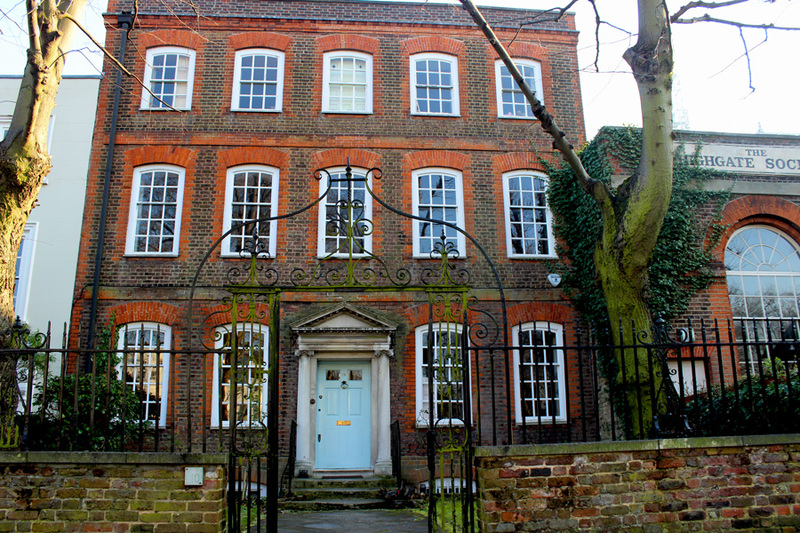 It has has this classical ‘village-feel’ to it, with its own High Street and suburban lanes. 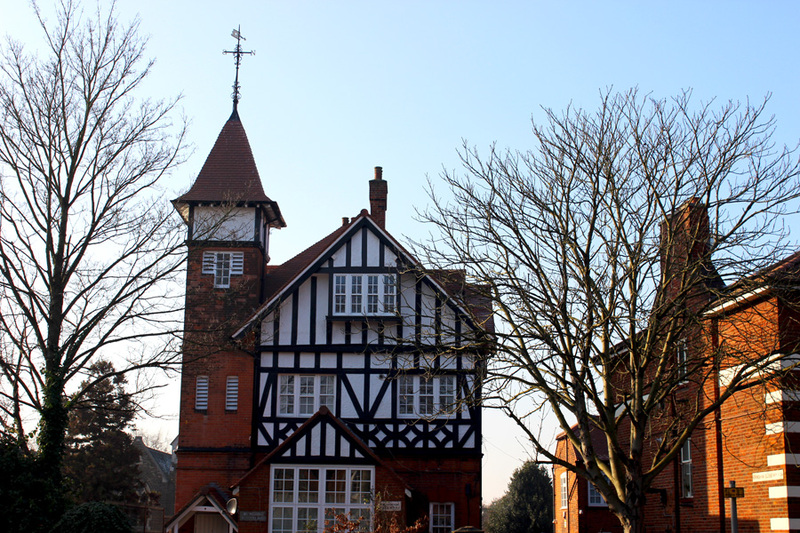 Highgate is a prosperous neighbourhood, with houses worth over millions of pounds. Even the chain restaurants, coffeeshops and retail shops are based in Georgian and Victorian-style buildings. Ample of celebrities have also settled here, but more about this later on. The area is built on a hill, which causes some splendid views from time to time. Famous Parliament Hill is also not far from here. 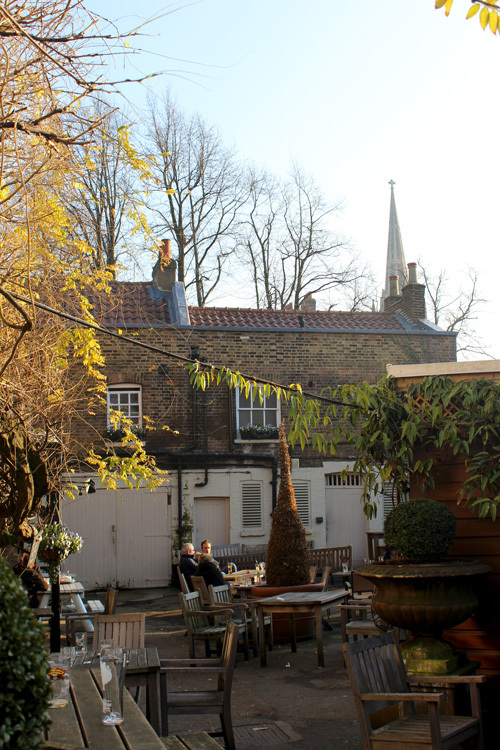 This is a favourite among tourists and locals alike for its striking skyline views over London. We started our walk on a sunny afternoon at Highgate Tube Station (interesting fact: Highgate Tube Station was one of the tube stations in London that was used as a bomb shelter in WWII). 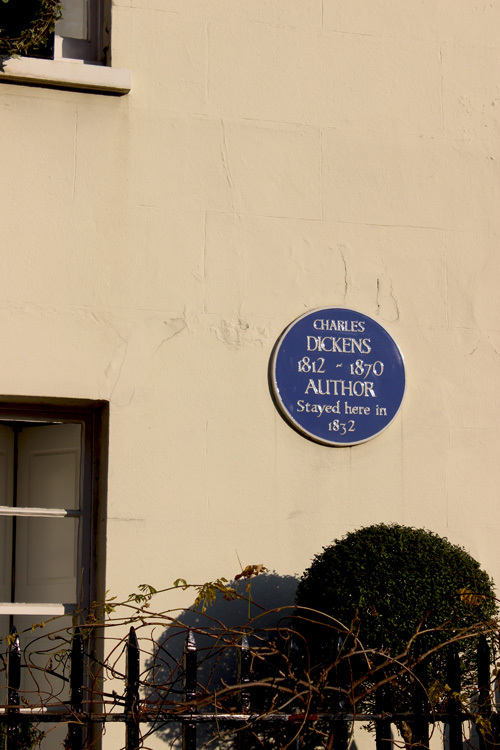 We made our way towards North Hill, where we found the house where Charles Dickes stayed in 1832. 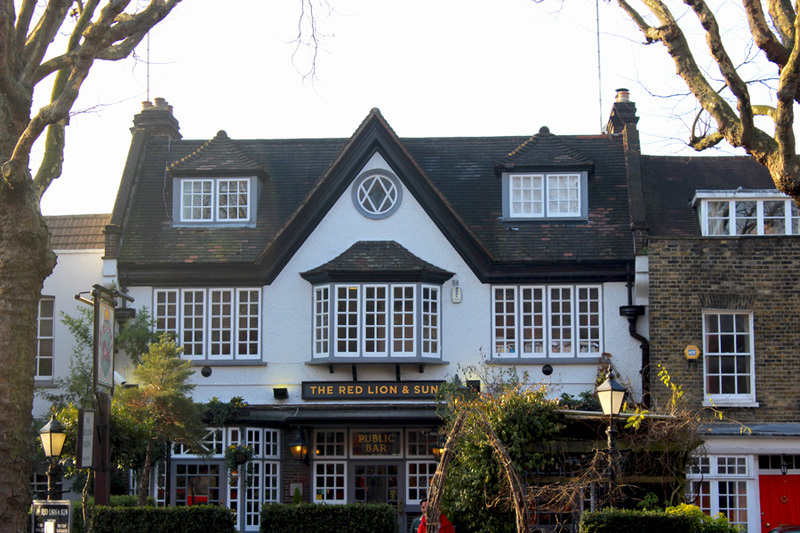 Further down the road we discovered the beautiful pub The Red Lion & Sun. 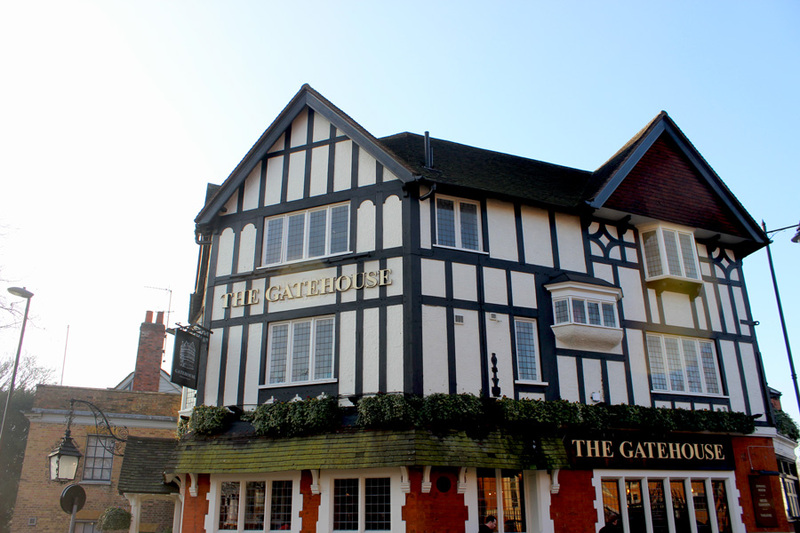 Right after prestigious Highgate School, we stumbled upon the beautiful timber-framed pub The Gatehouse. The name of this pub reminds us of the toll house that used to be located around here. The Bishop would charge toll for everyone entering his hunting grounds all the way back in 1500’s. We quickly turned onto Highgate High Street and left the buzz quite quickly again by turning right into South Grove. Lush Pond Square (without an actual pond) was on our right, The Highgate Literary and Scientific Institution on our left. 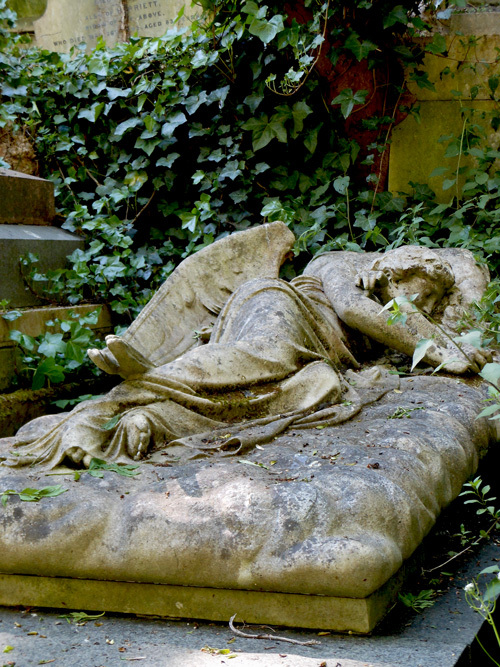 Not only nearby Highgate Cemetery has a ghostly past. Just down the road we came across The Flask, a pub dating back to 1663. Visitors of the most famous pub in Highgate have repeatedly reported the sighting of a Spanish barmaid haunting the seating area. Also, a man in Cavalier uniform appears to cross the bar regularly and then vanishes into a pillar… The Flask was also the place where one of the first-ever autopsies took place. I must say, nothing of this all crossed my mind when we walked by the pub’s garden, where groups of friends were enjoying their Sunday afternoon pints. We continued our little walk and entered The Grove: a favourite street among celebrities. 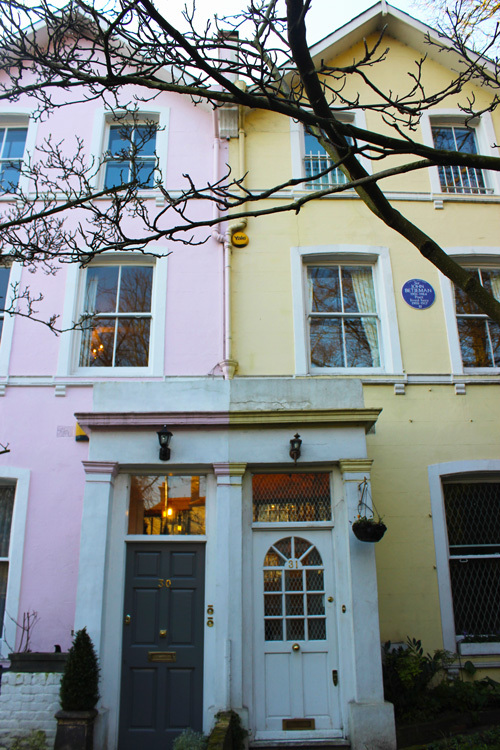 Apparently Kate Moss and Jamie Oliver both own a mansion here. 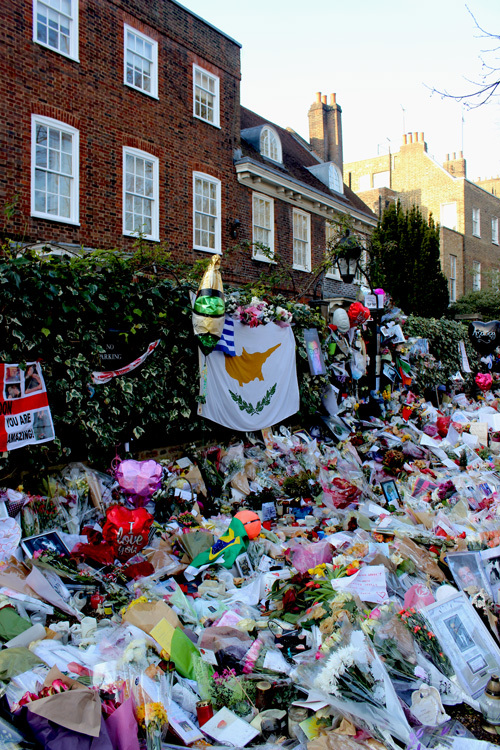 A striking sight at the period of doing this walk (late January 2017) was the ocean of flowers in front of George Michael’s property. We could not help ourselves stopping here and taking a moment to reflect. We didn’t realise how high Highgate Village is located (it’s all in a name I guess?) 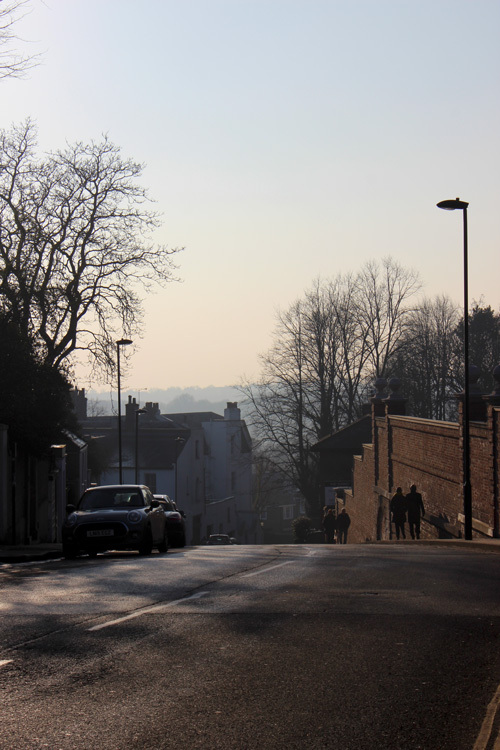 until we descended down Highgate West Hill. We noticed a few daredevil cyclists trying to conquer the hill, but it’s basically a hopeless task. This street is aligned with the most beautiful mansions – some safely tucked away behind tall security gates. 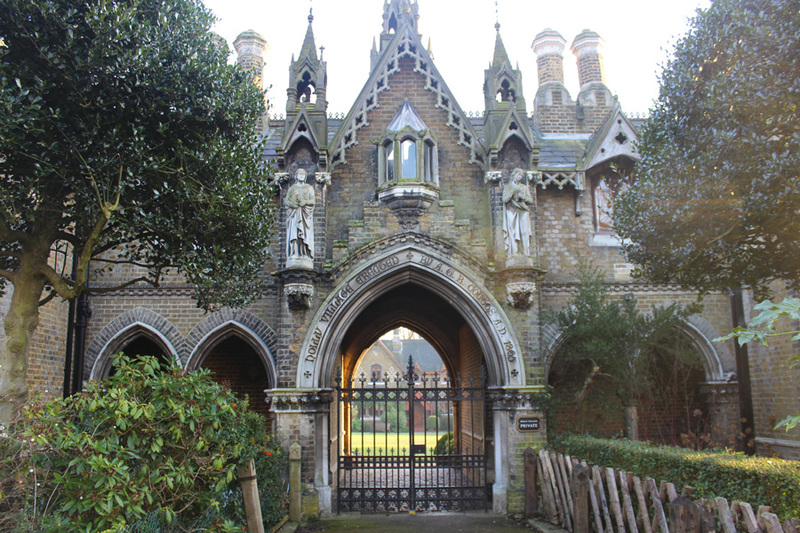 We turned into Swain’s Lane which quickly brought us to Holly Village: a Gothic private-hamlet nestled between the eastern part of Highgate Cemetery and suburban Chester Road. A very striking gate provides entree to these lovely-looking cottages. Unfortunately we were not allowed to enter the premises, so we continued our route towards Highgate Cemetery. Since we didn’t have much time left, we skipped it this time – but I can highly recommend a visit. Especially taking a guided tour of the West Cemetery. A magical/creepy experience! 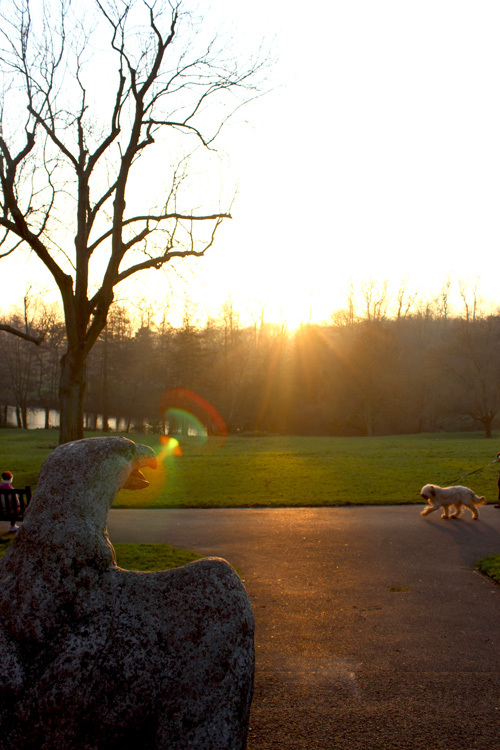 A lesser-known, but definitely a gorgeous green space, is Waterlow Park. This lush space makes you completely forget that you’re actually in one of the largest cities in the world. We went for a tea break to the middle of the park, where next to the Middle Pond, Lauerdale House is located. This used to be the home of the infamous Duke of Lauerdale in the 1600’s. It also appeared that King Charles II stayed here, and let his mistress Nell Gwyn reside here as well. I’ve watched a play about Nell Gwyn last year, so it was quite special to have tea in a house she used to stay in! 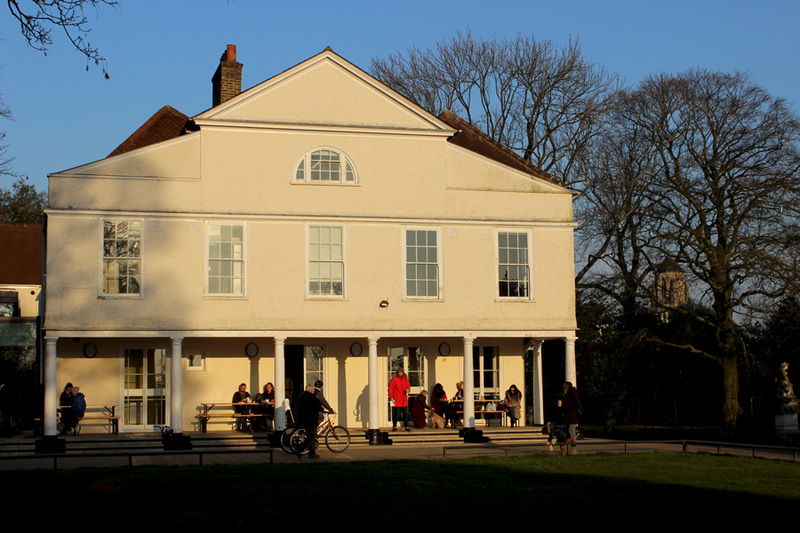 We exited Waterlow Park through the main entrance and turned right onto Highgate Hill. It turns out that London’s very first cable tramway opened here on this street in 1884. Unfortunately, it had to close again 1892 after a major incident. The tramway re-opened after some renovation works, but had to close again in the early 1900’s when the police refused to extend the licensing, due to safety reasons. Such a shame that it never developed further. It would be much more comfortable to ‘San-Fran-style’ ascend Highgate Hill then to walk it, right? All the way down the hill we reached Archway Station, which marked the end of our little walking tour.